So after hooning around like idiots on all five bikes, which ones made us want to wheelie off into the sunset? The 1290 is fast, leary and wheelies like a tuned moped with a 19-stone pillion. But it’s also easy to ride, stunning to look at and has the technology to keep all that power under control. The dash isn’t the prettiest and the rider aids won’t stay turned off, but that wasn’t enough to temper our fun. In two words: obscenely fast. The S1000R is a thinly disguised sports bike that uses clever electronics to make it work as a road bike. You’ll never get nicked for speeding on it, because there’s no way in hell you’d ever get caught. On an open, winding road, the only thing quicker is a small cartoon bird that says ‘beep beep’. 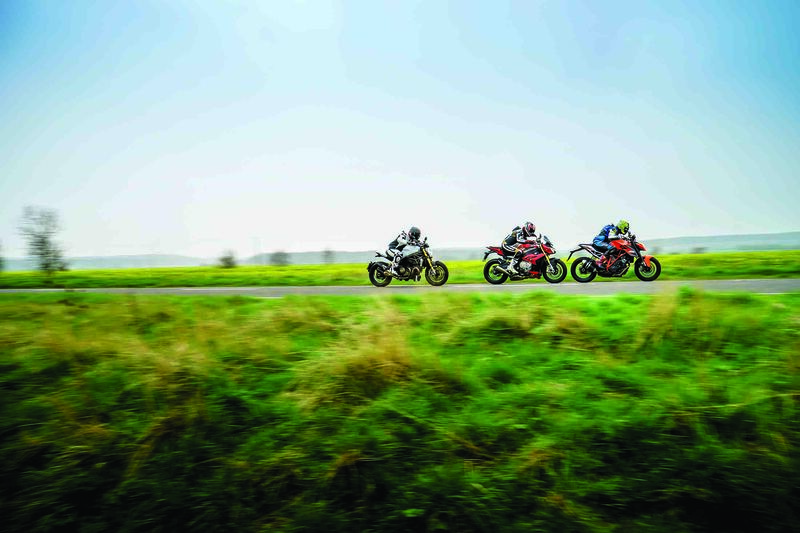 While the KTM, BMW and Aprilia were breaking land speed records, the Ducati was cruising along, enjoying the ride and sneaking off with their girlfriends. If looking good is just as important as going fast to you, then the Monster 1200S is what you’re after. Smooth, grunty and a joy to ride fast, just not quite as fast as the mad three. The power and engine can now definitely cash the cheques written by the wild, aggressive styling. Power delivery felt similar to the S1000R but without quite the same intensity. Takes the same approach of style and speed as the Ducati, but attacks it from a Japanese angle. It looks cool, goes well, and is the best value option of the two posers. It’s the purist of the bunch, the riders’ bike. The chassis is sublime, it steers the best and the electronics make the others look a touch clunky. It’s the best sports bike here and the winner for anyone with a mental age greater than six. Strikes a nice balance between the insanely fast BMW and the one-wheeling nutcase KTM. Wide bars, big power, sweet chassis. Bliss. There are two sets of bikes here; the hooligans and the posers. 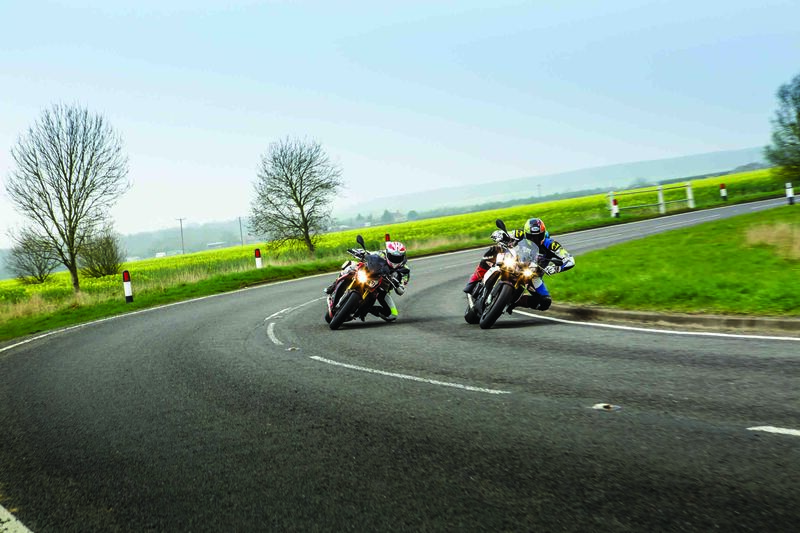 The Ducati and Kawasaki fall into the latter category, lacking the speed and poise of the other three. But that’s not a bad thing if the reason you’re getting into a naked bike isn’t so you can ride it like a sports bike without getting a bad back. Of those two, the Ducati’s chassis is sublime and it’s electronics package blows the Z into the analogue weeds. But if you’re a man’s man who doesn’t need none of that help and wants a proper muscle bike, the hench Z-thou is strong like bull. So on to the hooligans. The Aprilia is sublime, find yourself a good dealer and you’ll love every ride. Reliability issues? We’ve had a few in the past, but this bike performed faultlessly under our relentless abuse; see the note above about a good dealer… The BMW is insanely fast, covered in technology and, if you go for the base model, ridiculously good value at £9,990. The KTM is fast, but in a let’s-do-wheelies-out-of-every-corner way. The 1290cc motor picks up revs faster than anything else, charging the horizon in an orange blur. So which is best? Well, the Aprilia is the best bike for attacking a set of bends on, the BMW wins at going really fast and the KTM does the best wheelies. Which would we pick? The KTM. The price tag is the highest, but no other bike made us laugh quite so hard every time we swung a leg over. It’s great on the road, amazing on track and looks the maddest. And we really like mad.